Microsoft has a new feature in Office 365 for communicating with your team. However, sometimes you don’t need to include everyone in a team as part of the conversation, or perhaps you don’t have Office 365. There are some existing features that may suit your needs and give you the flexibility to get quick answers from your team, or a subset of your team. Users know how to send to distribution groups. But when composing a mail, they can actually expand the group to list out all the members of the group by hitting the + icon next to the group. Once that is done, you can remove people that aren’t relevant to the conversation. Alternatively, you could setup a “Team Email” option. 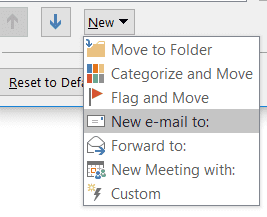 Leveraging a Quick Step feature, I’ve enabled the New Mail option to have an email composed to specific users (this could also be a distribution list that you expand as necessary). I don’t like flooding everyone’s inbox with items, so I try to be a bit more selective with the mail recipients. However, if I try to add individuals by memory, I may forget to include someone. For this reason, I like to start with an expanded group and then remove people. Additionally, I often find that there are people in my group that may have valid input on the subject that I may not have considered initially. I may also leave others on that I think may benefit from reading the conversation based on some of their goals/interests, even if they likely won’t be an active participant in the solution. Similar to the Outlook feature detailed above, you can add an existing group to your Skype client, or build an ad-hoc one. If you’d like to create your own group, just hit the add icon in the upper-right corner and choose the option to create a new group. You can then associate people with your new group. To communicate to your team, you can right-click on the team and choose the method (Instant Message, Email Message, even Conference Call). 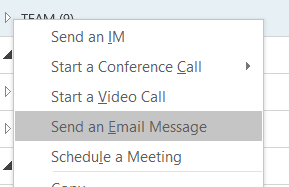 And just like in Outlook, you can remove people from the IM conversation based on your needs. While Microsoft continues to add new features on how to collaborate with your peers, sometimes there are existing methods that may have been overlooked. If you need help with these or finding other hidden gems, email info@peters.com. We are happy to help.